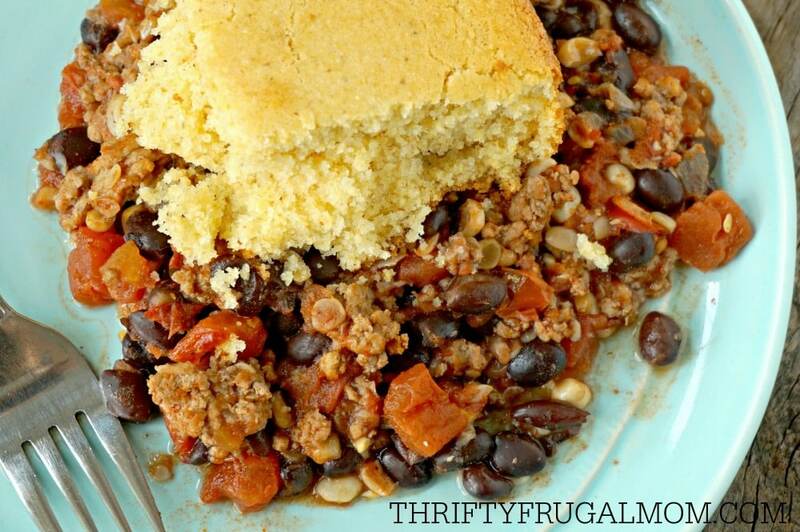 This Crockpot Tamale Pie is the perfect frugal family crockpot meal! It’s hearty, filling and best of all, a quick and easy recipe. When I was in third grade, my teacher had a pet hamster that she kept in our classroom. We had so much fun feeding that little guy and taking care of him, but the thing I remember the most about little Mr. Hamster was how he would jump on his hamster wheel and run, making that thing spin like crazy! It always intrigued me and I remember wishing for my own wheel to run on because it looked like so much fun! The last couple of weeks I felt a lot like that hamster running on his wheel- the biggest difference was that all my spinning did actually accomplish things. My husband’s sister got married and we were out of town for 4 days for the wedding, both our boys had birthdays and of course birthday parties too, I put 2 bushels of peaches in the freezer, we had numerous guests here for meals and well, you get the picture. It was all good, fun stuff, but whew, it was exhausting and hard to keep up with everything! Anyway, one of those hectic days last week I was trying to think of something simple to make for dinner and suddenly remembered this frugal family friendly crockpot recipe! We first enjoyed this years ago when we were visiting my husband’s sister and her family. His sister is one of those people that is super efficient and organized and makes raising 5 kids that are 7 years apart in age look easy! So when we’re at their place, I always enjoy observing how she does things and like to see what foods she makes. That night for dinner she made this Crockpot Tamale Pie. I had never even heard of Tamale Pie before and was intrigued. Cornbread with Mexican type food ingredients? It sounded delicious and it was. I fell in love with it instantly! And unless you hate cornbread, this is one of those recipes that you really can’t go wrong making! 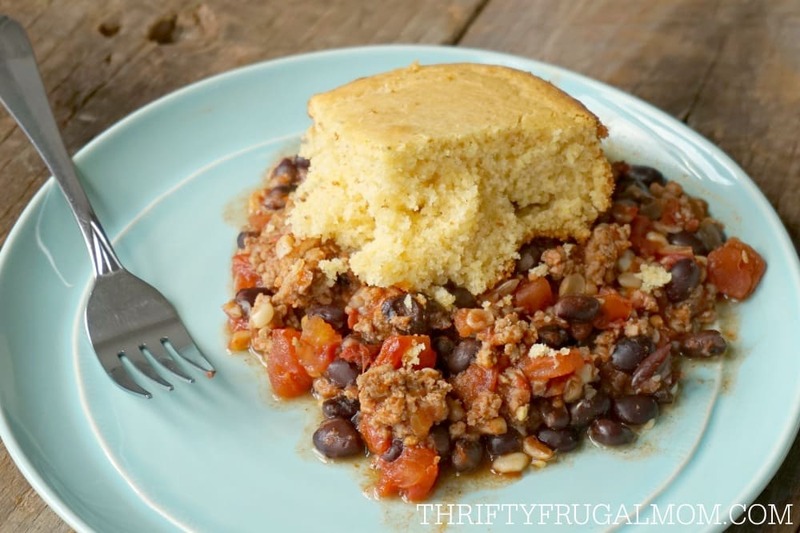 The ground beef and beans make it a hearty dish, the tomatoes and taco seasoning give it lots of juicy flavor and the corn bread tops it all off perfectly and makes it super filling! And to top it all off, it’s ready with just 10 to 15 minutes prep time! Give it a try yourself- it’s a great frugal family meal that you’ll love! Looking for a great place to get quality ground beef? Check out Savory Butcher! They are a growing company and aren’t available in all areas, but are slowing expanding their market! They regularly have ground beef for $2.99/lb. And they also have boneless, skinless chicken breast for $1.99/lb. too! 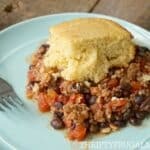 Crockpot Tamale Pie- a frugal meal the whole family will love! In bowl, combine cooked beef, black beans, tomatoes, corn, onion and taco seasoning. Mix well and pour into greased slow cooker. Prepare cornbread according to package directions and spoon over beef mixture. Sprinkle with cheese and cilantro if desired. Serve with sour cream and salsa and tortilla chips, depending on your preferences. * If using home canned diced tomatoes, I typically use 3 to 4 pints. ** I just use our favorite homemade 9x9 pan size cornbread recipe. You can still make this recipe! Just mix up the bottom part in a big pot and let it simmer for 20 min. or so on the stove top. Then make your favorite cornbread, bake it and when you are ready to eat, either top the cornbread with the bottom mixture or top the bottom mixture with the cornbread. Requires a bit more work, but it's just as delicious! Yes, I agree! The cornbread is really what takes it from okay to amazing! I hear you on the breaking your Crock Pot in more. :) Recipes like this make it so easy though. Oh this looks absolutely delicious and so comforting! 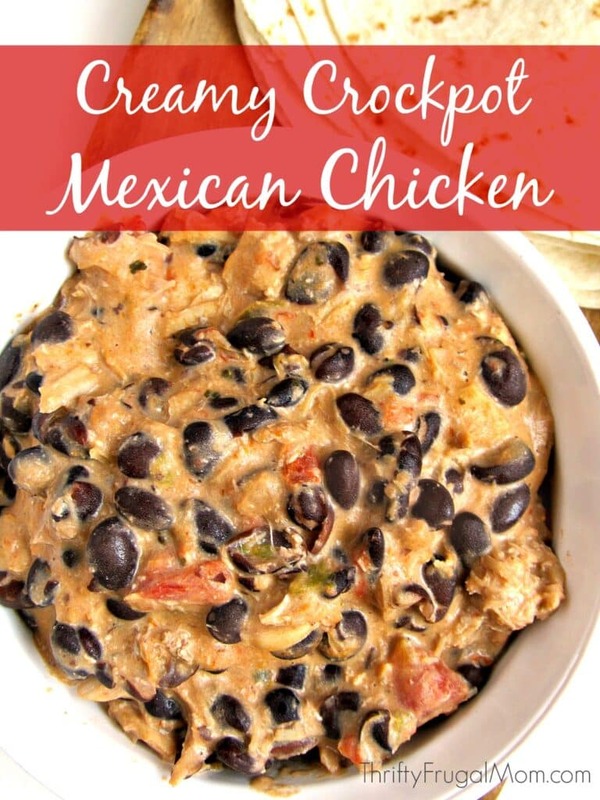 What a fabulous recipe for the crockpot...pinning for later! Love that you made this in the Crockpot! 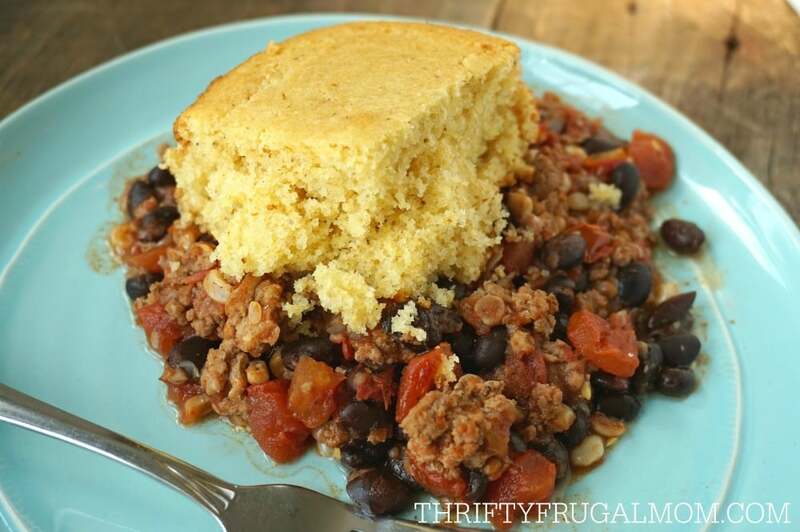 I have a weakness for cornbread dishes so this is right up my alley! I hope you give it a try, Nicole! You'd get to enjoy a little cornbread in every bite. Yum! This looks fabulous!! Can't wait to give it a try... thanks for the great deal on ground beef. My son loves tamales so I'm so happy I can make this delicious variation for him! It's such a great recipe! Glad you all enjoyed the variation, Christina! I don't use my slow cooker nearly enough. Thanks for this simple and delicious sound meal idea! I'll be dusting off the slow cooker and making this soon!